A very strange and annoying but happens when importing a screen recording into iMovie or Final Cut Pro X. After taking a screen recording using QuickTime, when I try to import it into iMovie or Final Cut Pro X, the entire clip is covered with this red tint. There is an easy fix. 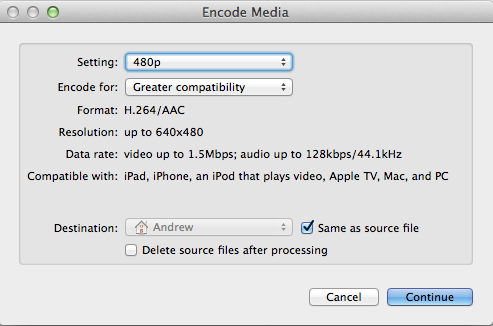 Before importing the video into iMovie or Final Cut Pro, right click on the file and select “Encode Selected Video Files”. For me its under the “Services” menu. Now wait a few seconds or minutes, depending on how long your video is. It will make a new version that can now be imported without any red tint or filter. So easy! Credit for this goes to Michael Rygaard and his video. Very easy – simply press ‘B’ and the cursor will switch to a blade icon. Click on the clip where you want to split it, and done! Press ‘A’ to switch back to the normal cursor. I couldn’t figure out how to get the blade cursor to show up in a screenshot – anyone know how to do that?